Description: Forced to provide for his mother and brother after his father's death, Huybrechts was prevented from having a normal career and he lived at home, estranged from outside society for most of his life. 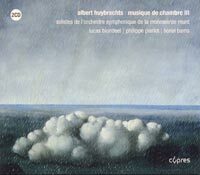 His music reflects this in its uneasy mixture of anger, vacillation (the Concertino of 1932 and the wind quintet of 1936) and dreamy beauty (the Sonatine and Pastourelle of 1934) while, rather uniquely for his time and place, he forsook the Franckian school for interests in Debussy, Schoenberg (although Huybrechts himself never wrote anything atonal), Bartók, Stravinsky, Honegger and Milhaud. 2 CDs for the price of 1.